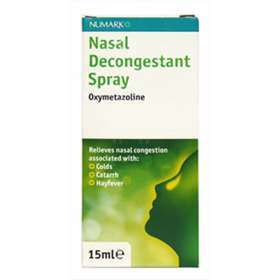 Numark Nasal Decongestant (Oxymetazoline) Spray - For Fast Relief of Nasal Congestion Associated with colds, catarrh and hayfever. Adults and the elderly - Hold the container upright, place the tip of the spray nozzle in each nostril in turn and squeeze the container twice firmly as you breathe in. Repeat up to 2 times daily or use at bedtime to give relief through the night. Oxymetazoline Hydrochloride (0.05%w/v) as the active ingredient. Benzalkonium Chloride, Thiomersal, Sodium Chloride, Menthol, Eucalyptol, Camphor, Methyl Salicylate, Poloxamer, Sodium Citrate, Anhydrous Citric Acid, Purified Water.